One gorgeous US hand made coin shaped lampwork glass bead sits at the center of this bracelet. 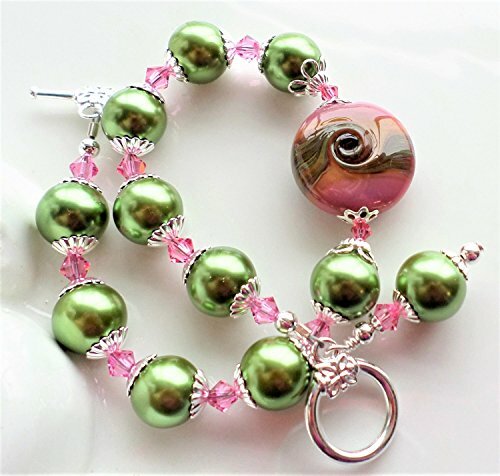 The bead has a base of shiny muted rose pink and is decorated at the center with unique twisted stripes in green and muted gold. It is so shiny and such a high quality bead that I'm sure will be a favorite! For the chain I have added pretty green glass pearls along with Rose Pink Swarovski Crystals. The bracelet closes with a bright silver brass toggle and measures 8 inches in length.